All right people. Tell me a political type book that I should read that provides a completely different viewpoint from what I normally propose here. I’ll buy the book, read it thoroughly and look for the positive in a forthcoming review. PS- I would prefer something written recently and less than 300 pages! Picture: something one of our artists came across. We didn’t paint this. My day started at 4am. I was up before the dawn eating a bowl of granola and raisins (I’m cutting down on the sugar– probably already reducing total intake in half). I watched a few episodes of the Simpsons while whittling down the Inbox. I pretty much hung out at home this morning, finally sauntering into the studio by myself at noon. 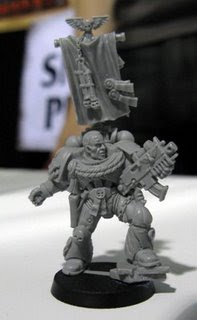 A client came by– he’s building a Legion of the Damned army. We have very, very few clients inside Utah, so it’s nice to get some face time. I picked up around the studio, making good inroads into the assembly room. The bitz are a constant battle. Think about how much is left over from painting an army every day! This is a HUGE benefit to BTP customers. We don’t sell the bitz, we just keep them around just in case you need something. Often we’ll take care of a lot of problems that you never even know about. Clients don’t pay for the bitz when used in their projects. On the other hand we also keep all the leftover bitz. 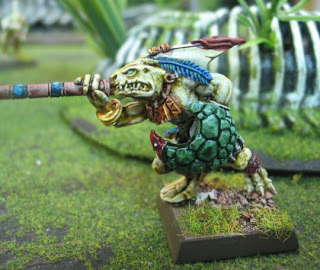 I’m using Lizardmen Skinks as kobolds in my D&D game. 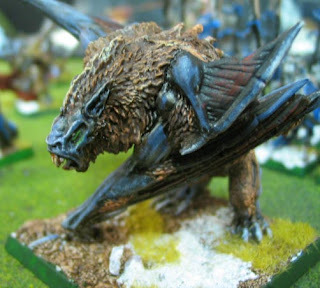 I’ll probably sub in various items from the Lizardmen range. Tonight I brought home a bunch of other various figures to paint up for the D&D game. I’m super-stoked about that. Dungeons and Dragons Fourth Edition is the best miniatures battles game I’ve ever played. Yes, I just said that. It can be played on an open board just as easy, replacing squares with inches, and using the round 3/4/5″ template from Hordes for the various area effect powers. Around 7pm my wife calls and says “isn’t the Ward BBQ tonight?” After slapping my forehead I headed out to that with a watermelon and a huge knife (which I keep around the studio in case of emergencies). That was a slice of paradise– lots of food and good friends and family. I really enjoy my family. It’s great to see the kids discover everything for themselves the first time. 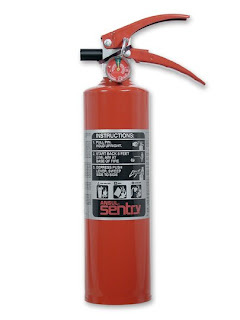 Case in point, the two older kids found the fire extinguisher in the car and sprayed the whole garage with a coat of fine powder. In other news, I am selling off all my 40K armies. Don’t be sad. I’ll build them up again. Always something new. 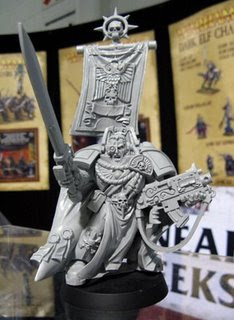 More details are coming, but here’s what I got so far:Questing Knights: $950 for 2200 ptsDragons of Moloch: $950 for 2300 ptsTau Verdaan Sept part A: $800 for 1500 ptsTau Verdaan Sept part B: $800 for 1500 ptsEmail me if you wish to inquire seriously. You can have all three for $3500. I just put up a new post– four posts down from here. It’s something I’ve been working on for a few days. 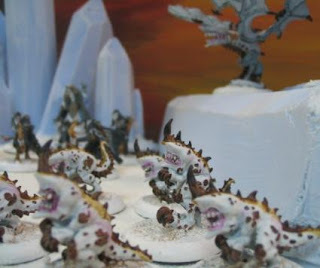 Friday June 27 2008 Hard at "Work"
Picture: a herd of Shredders from a Legion of Everblight army. That’s for the game of Hordes, which I highly recommend. This morning I got up at a respectable 8am to find my lovely wife already up. She made me some french toast and cantaloupe slices. The guinea pig and rabbit are fully running around in the back yard. I got to “work” at 10am where I met with my fellow-conspirators for a game of Fourth Edition D&D. I’m running my own spin on Keep on the Shadowfell (this title harkening back to Keep on the Borderlands). I painted up some Lizardmen Skinks to represent kobolds. Those turned out very well with yellow-bone colored skin and green-blue scales. I’ll take some pics soon. I will probably flesh it out to a whole Lizardmen army. I have nothing but a glowing report for Fourth Edition. It’s four times as good as previous editions! Now that I think about it, I’m generally happy with new editions of any game. First level characters have a load of options to spice up a combat and it works ever so smoothly with miniatures on a table. We ordered two pizzas for the game: one hawaiian, and another half combo half pepperoni. Email me if you wish to inquire seriously. You can have all three for $3500. I got a haircut yesterday morning at an old-timey barbershop downtown. I love that, it feels really good to have that mop off. Tomorrow, I will be paying the price for the D&D game. I’ll be down at the studio for a full spread. This is a famous 40K web comic. Hey all. I have a splitting headache, which is unusual. You will need to give me a pass tonight. I do have up some new Youtube material, though. Anyone want me to post my rant on Inflation (that I wrote earlier but have not posted because it’s really too much). I beg to differ. This has everything to do with both of those things. I openly invite thoughtful and polite discussion of this topic. “All right, some may say, prices may indeed rise, but so do wages and salaries, and therefore inflation causes no real problems on net. This misconception overlooks one of the most insidious and immoral effects of inflation: its redistribution of wealth from the poor and middle class to the politically well connected. The price increases that take place as a result of inflation do not occur all at once and to the same degree. Those who receive the new money first receive it before the prices have yet risen. They enjoy a windfall. Meanwhile, as they spend the new money, and the next wave of recipients spend it, and so on, prices begin to rise throughout the economy—well before the new money has trickled down to most people. 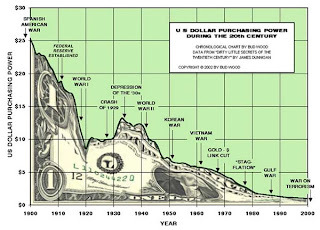 The average person is now paying higher prices while still earning his old income, which has not yet been adjusted to account for the higher money supply. 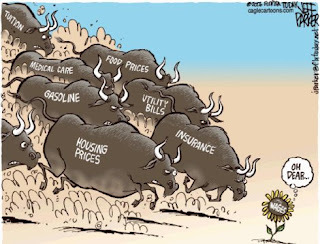 By the time the new money has made its way throughout the economy, average people have all this time been paying higher prices, and only now can begin to break even. The enrichment of the politically well connected—In other words those who get the newly created money first: government contractors, big banks and the like—comes at the direct expense of everyone else. These are known as the distribution effects, or Cantillon effects, of inflation, after economist Richard Cantillon. The average person is silently robbed through this invisible means and usually doesn’t’ understand what exactly is happening to him. And almost no one in the political establishment has an incentive to tell him. “When the value of Americans’ savings is deliberately eroded through inflation, which is a tax, albeit a hidden one. I call it the inflation tax, a tax that is all the more insidious for being so underhanded: most Americans have no idea what causes it or why their standard of living is going down. Meanwhile, government and its favored constituencies receive their ill-gotten loot. The racket is safe as long as no one figures out what is going on. Here is an article that suggests something different. It’s my opinion that my party (the Republicans) have betrayed me. They didn’t stay in budget. They weren’t honest. They told me the taxes would be low, but they didn’t reign in spending. They just printed money to make up the difference. Well, at least my congressman (Chris Cannon) went along with this. And I say good riddance to him! (Chris Cannon was ousted in the recent Republican primary in Utah). Did your congressman and senator go along with this? Did they betray your trust? So, do you really care about this? Offer is half price, $212 plus $9 ship. I’ll ship them out to you just like that OR you can commission them. 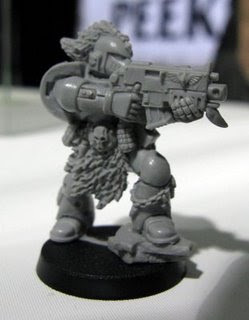 Cost for a L3/5 split (everything assembled and painted) is $850 plus cost of models. 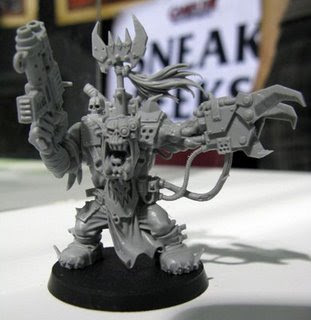 Cost for a L2/4 split (everything assembled and painted) is $590 plus cost of models. If anyone cares to commission them (sending in a half down deposit) by June 27 2008, I would give a $50 credit towards the project (for early setup). Get an EXACT breakdown of costs. You can get a full set of movement trays (four of them magnetized and painted/based, and metal plates on all the figures) for $95. 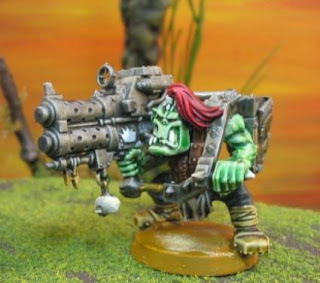 Thank you so much for the over nighting of the Ork minatures. They look so awseome. Whats even kooler, is I played in a rogue trader today and won first place overall and ALSO first place for themed army. 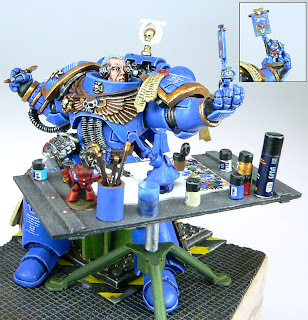 You guys rock, and my army was a great advertisment, I built a 2′ X 2′ carrying board as well so prety much there was a blue table painted army up all day on display at our local Warhammer shop. Also, please thank the artist personally. He did a tremendous job and the second batch looked identical to the first. So kool. I wont have money for another order for several months. 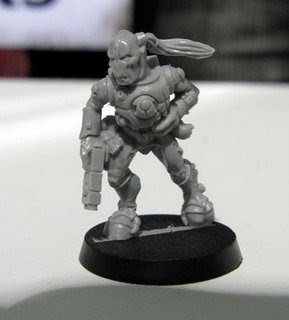 So, if that artist was thinking about leaving any time in the future could you give me an advance and I would try and get some models into him before he were to leave. That seems highly unlikely but just in case.